The City of Austin will begin construction this summer on the West Austin SSO Abatement Project. The purpose of the project is to avoid wastewater overflows by replacing deteriorating wastewater lines in the Allandale and Rosedale neighborhoods. 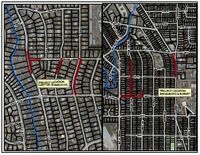 The aging concrete lines will be replaced with 3,000 linear feet of 8-inch PVC lines on sections of West 46th Street, Shoalwood Avenue, Burnet Road, Shoal Creek Blvd., Cary Drive, White Horse Trail and Nasco Drive. As part of the project, 28 properties will receive new lateral wastewater connections. These connections will be installed at the City’s expense, at no cost to the property owners. Affected property owners will be notified this week and asked to sign Rights of Entry to allow work to be done. The project contractor will meet with each property owner in the coming weeks to determine the best location for the new wastewater connection. The City expects to select a contractor in June. For more information on the West Austin SSO Abatement Project, call the project hotline at 512-684-3232. If you wish to be added to the project email list, please contact Diana Peña at dp [Email address: dp #AT# groupsolutionsrjw.com - replace #AT# with @ ].